ANGA, COLOGNE: Sami Djebril and Naser Haify from Appear’s sales team summarize the spring fair in Cologne. Could you mention some of the highlights with 2018’s exhibition? Well, Appear covers a very broad sector. Our new hardware product, the X-series, addresses the bandwidth and low delay applications such as contribution. Other product lines cover more distribution like applications, while our software is mostly designed around OTT delivery. So, these different sectors have different drivers. In terms of contribution, I almost want to compare today’s situation with a kettle that keeps boiling on the stove. You know, when the top makes a kind of whistling noise, Djebril says. I think that is where we are with the crossover between SDI to IP. It’s overdue, and there is a lot of pressure on many fractions to come together and unite under one standard so we can move forward. As an industry we have everything to gain, and Appear TV foresaw this development a long time ago, being able to offer a dedicated hardware platform for the future encoding purposes of contribution as well as the uncompressed segments. This is and will continue to be a very important issue for the whole industry also in 2018, Djebril says. We have been extremely excited to showcase our X-series here at ANGA. What we’ve done is to combine ultra-high density with exceptional performance. We’ve made it modular to keep it as flexible as possible, as well as hot-swappable for a minimum of downtime. Not to mention our patented redundancy, Haify says. Now in terms of OTT, I think there will be continued focus on business models. How to earn money on the over-the-top offering. Many operators also consider barriers to entry and the cost of setting up an OTT service at all. You know, should you have one in the first place? And if so, should it be free? And if it is free, how should the service create revenue? 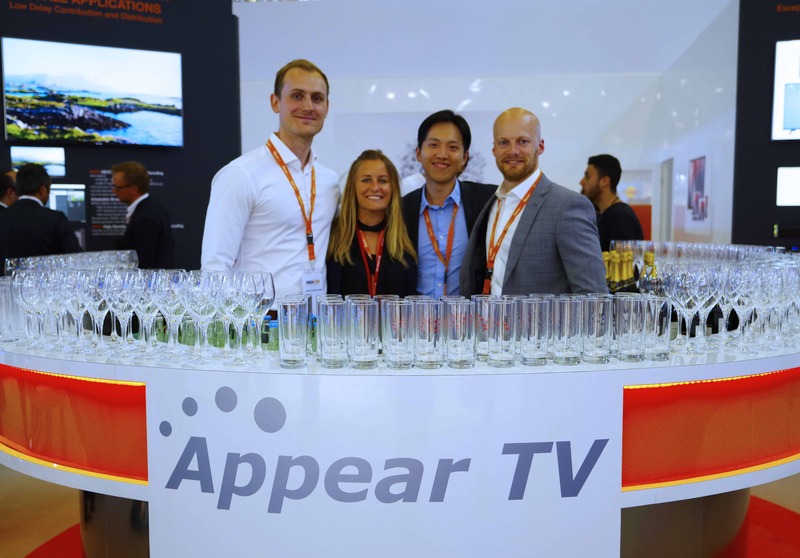 Appear TV pre integrated solutions makes it possible for an operator to have a fully installed OTT service up and running in 30 days. And build from there based on viewer numbers and demand. We make OTT faster to market, without locking our software to specific hardware. What are the European customers most interested in at the moment? The development of our X platform is very much linked to the transition from SDI to IP. It’s not really territory-specific, but rather technology-specific. Wherever the overall infrastructure allows IP-based transmission, the X platform should be featured. For example, in regional studios, stadiums, TV vans… And the list goes on. In what way does ANGA COM differ from other major fairs such as the IBC?